This widget displays the comments feed from your Facebook Live video post. You can also customize the chat display’s colors, fonts and text size. This widget is not pre-installed, you will need to install them through the Plugin Store. Once installed, you'll be able to find them under the Add source menu and then Facebook Widgets. Go to Add source > Facebook Widgets then Live Comments. The Facebook Live Comments widget will now appear on your scene. 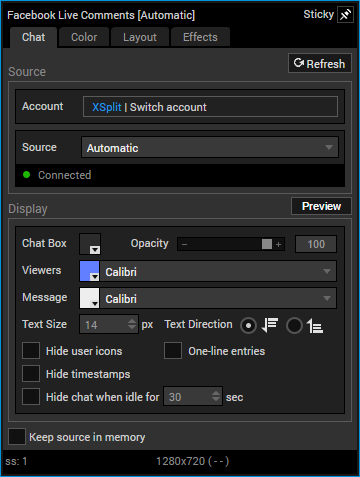 This widget will automatically connect to your live video if you've authenticated your Facebook account with XSplit Broadcaster. It will display Not connected to any Facebook Live post if you're are not currently broadcasting to Facebook Live. 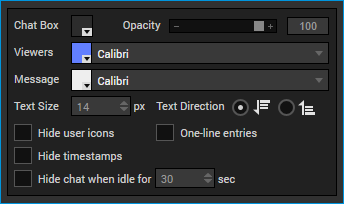 Right-click on it to show its properties window. Displays the currently authenticated Facebook account. Your Facebook account is automatically authenticated with the plugin if you login into XSplit Broadcaster using your Facebook credentials. Click on Switch account to switch and authenticate a different Facebook account. Changes the chat box's background color. Click to choose from a preset pallete or to enter a hex triplet. 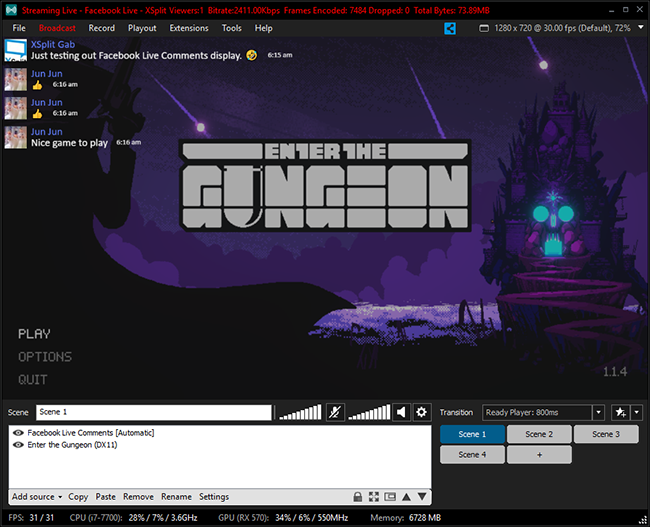 Changes the chat box's background opacity. The opacity slider will go from 0 to 100 percent. Changes the size of the viewers' names and comments. Can be changed to a minimum of 8px small and a maximum of 200px large. Changes the direction of how the comments scroll. Enable to hide viewers' profile pictures from being displayed with their comments. Enable to hide the timestamps shown with viewers' comments. Hides the widget after a set amount of time. Idle time can be changed to a minimum of 10 seconds and a maximum of 1000 minutes (60000 seconds). Enable to display both the viewers' names and comments in a single line.